The Magnolia Home Pier and Beam End Table brings a hint of industrial appeal to your living space with its clean geometric profile. It features a smooth top and a spacious drawer for tucking away your essentials, and is supported by durable square legs. Designed in a minimalist silhouette, this transitional-style home furniture blends well with most any interior style and subtly enhances its visual appeal. The overall build is solid wood which I like. The sales staff was good, as was delivery staff. When I inquired about the “scratches” there was some confusion between sales staff and warehouse. 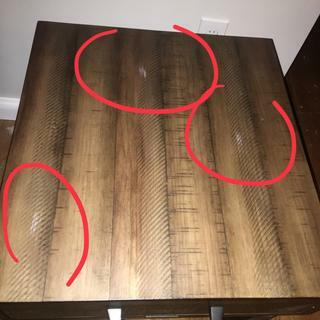 Just do not know why would purposely place white/ gray marks on dark brown furniture pieces.